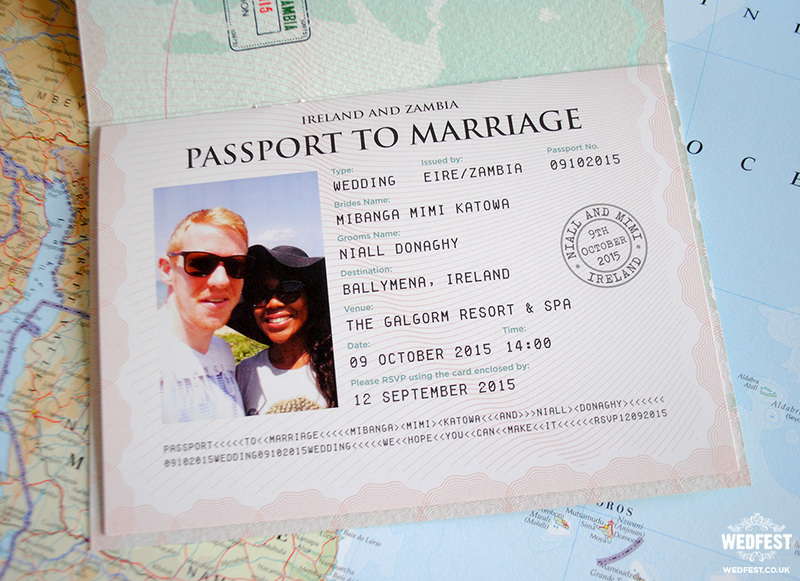 Passport Wedding Invitations – It’s been said that marriage is a passport to a lifetime of happiness. We know that some folk do like their wedding and the wedding invitations to reflect a solemn or more formal air for the occasion. However, many other couples prefer to make it a more boisterous celebration, a happy day in every way. They are keen to find ideas to theme the event, but also to find an interesting, maybe intriguing, style for the invitations they send to those they wish to join with them for their special day. We already offer a wide range of different ideas for wedding stationery, such as festival, musical, cinematic, sports and many other themes. Of course, we’re always looking to add to these. Which brings us back to our first sentence, and the idea of the ‘passport to happiness‘ or the ‘passport to marriage‘ . 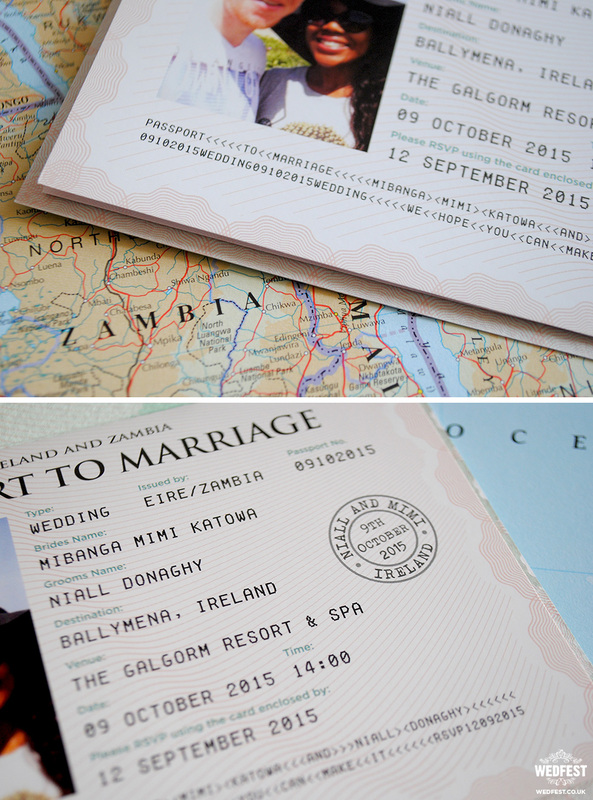 Introducing our latest addition to our wide range of themed wedding stationery – Passport Wedding Invitations. 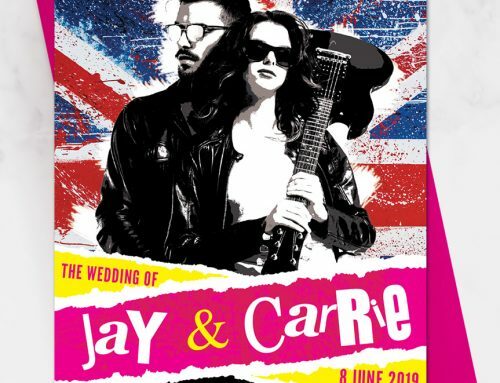 The moment anyone opens the envelope and finds what appears to be a passport, as well as a wedding invitation, in front of them, they’ll know that if the wedding invitation is this cool then this wedding is going to be a good one! 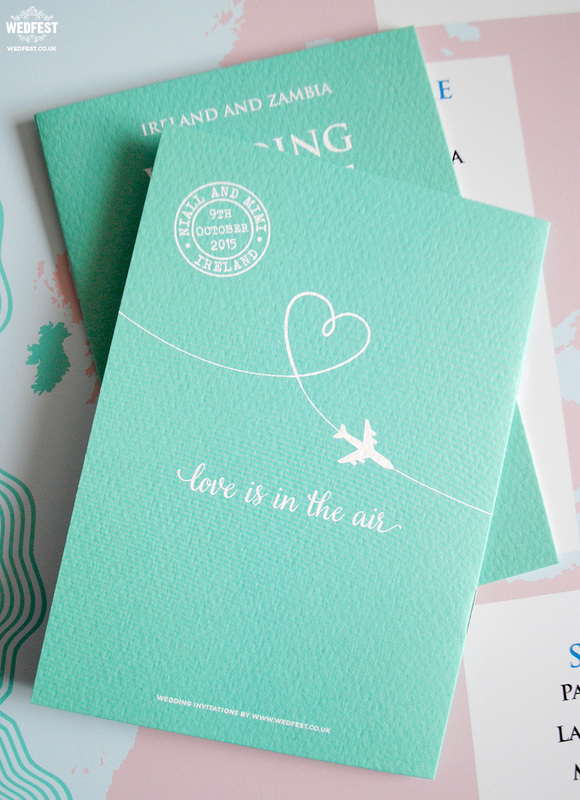 Obviously, our superb invites are perfect if you’re one of the increasing number of couples flying off to a destination wedding abroad, and is a great way of highlighting the fact to those folk you are inviting to come with you. 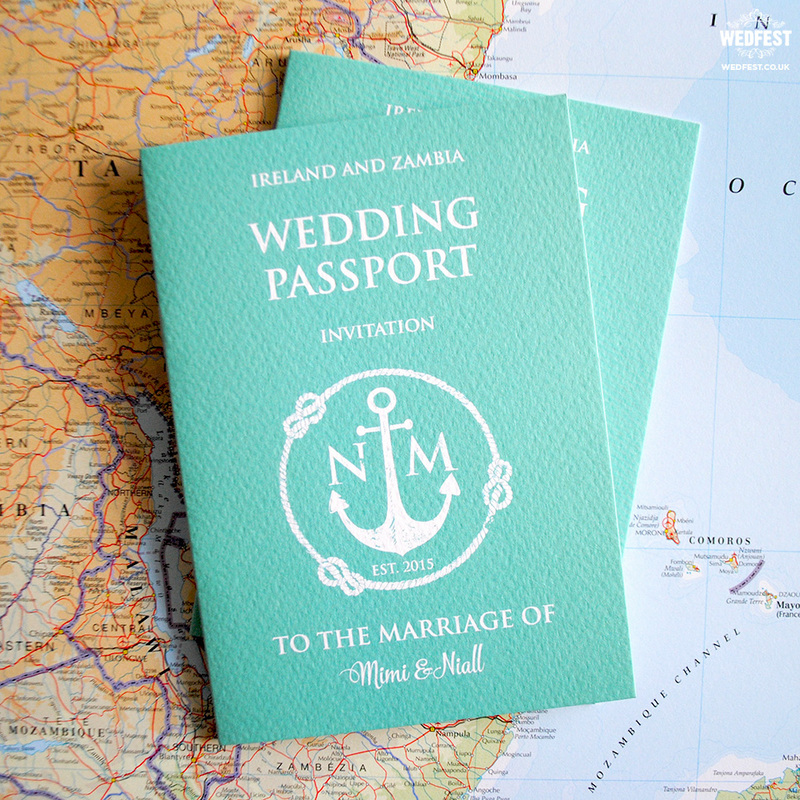 These passport wedding invitations are an equally terrific choice if the day will see either yourselves or some guests flying in from overseas for your special celebration, or simply if the pair of you are eager travellers, or are about to set off on a long-distance or multi-destination honeymoon experience. 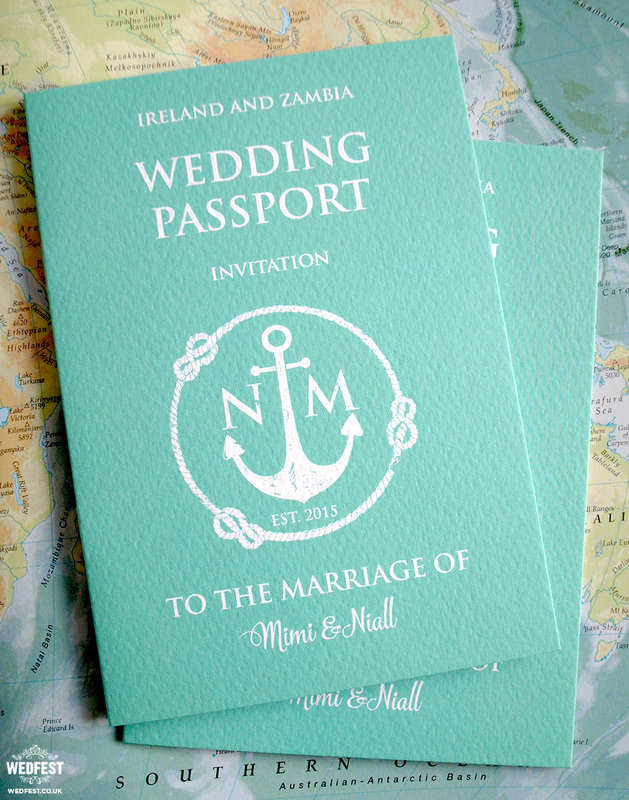 And, after all these other reasons, these passport wedding invites are also a great attention-getting idea for any style of wedding in any location! 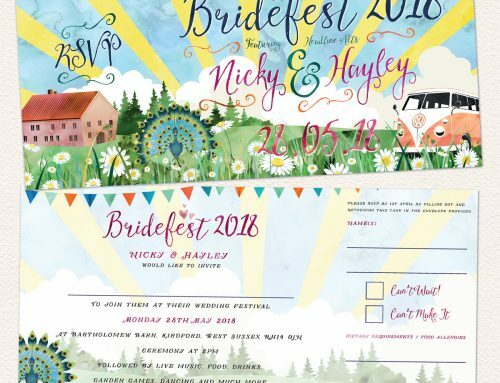 You’ll be pleased to know that we can turn these into thoroughly personalised invites, designed to your specific requirements, to create the atmosphere and mood that you wish to provide for those coming to join you in your joyful time. 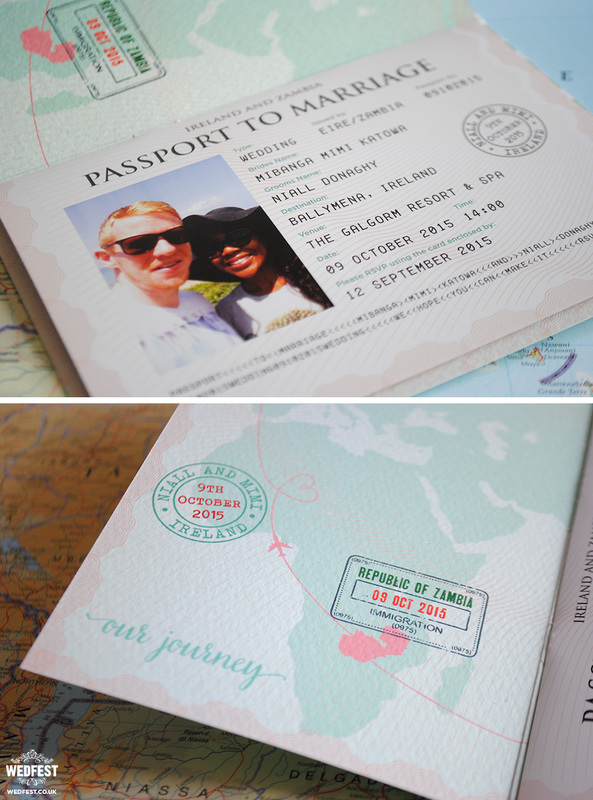 As you can see by the examples on this page, these passport wedding invites were the perfect option for this couple. Niall the groom is from Ireland and Mimi the bride is from Zambia. 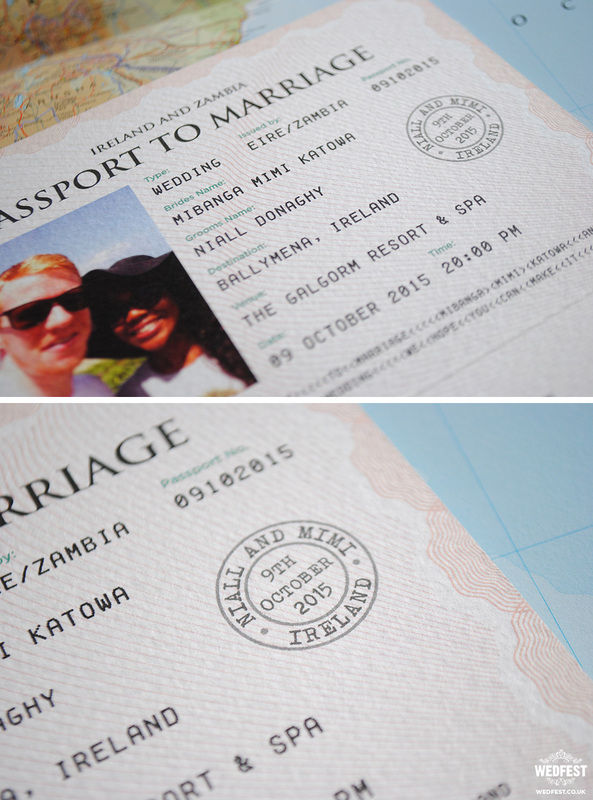 The couple met in Australia and were getting married in Ireland so a passport travel themed wedding invite was well suited to them as their relationship had taken them to many places around the world and probably will take them to even more. 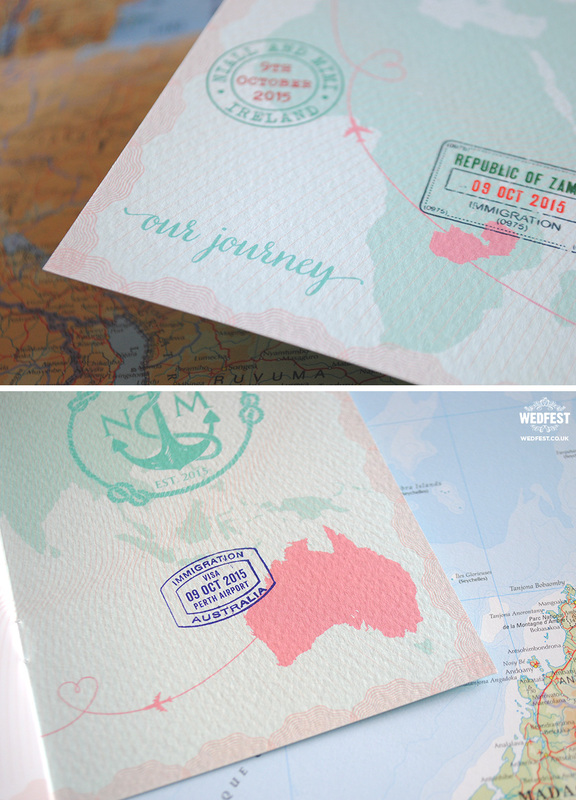 For this type of couple travel themed wedding stationery makes perfect sense. 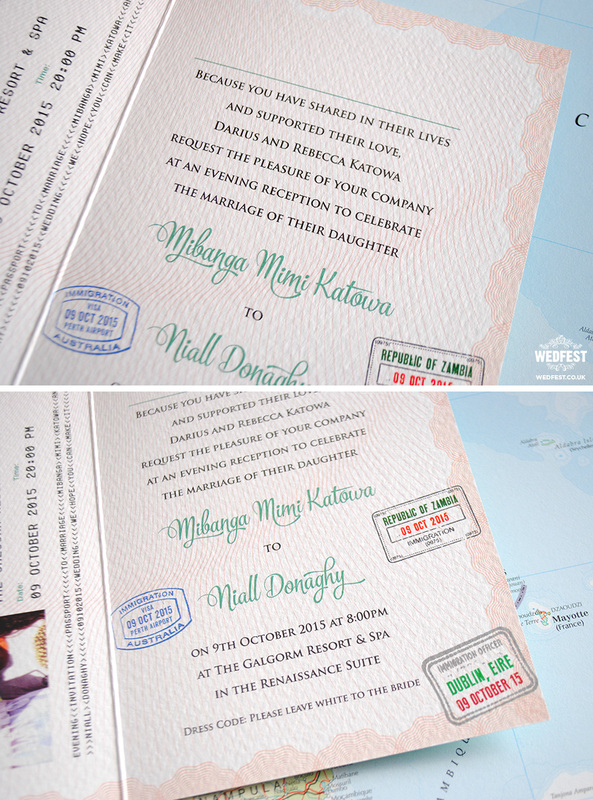 The front of the Passport Wedding Invites states the country of both the bride and the groom at the top. 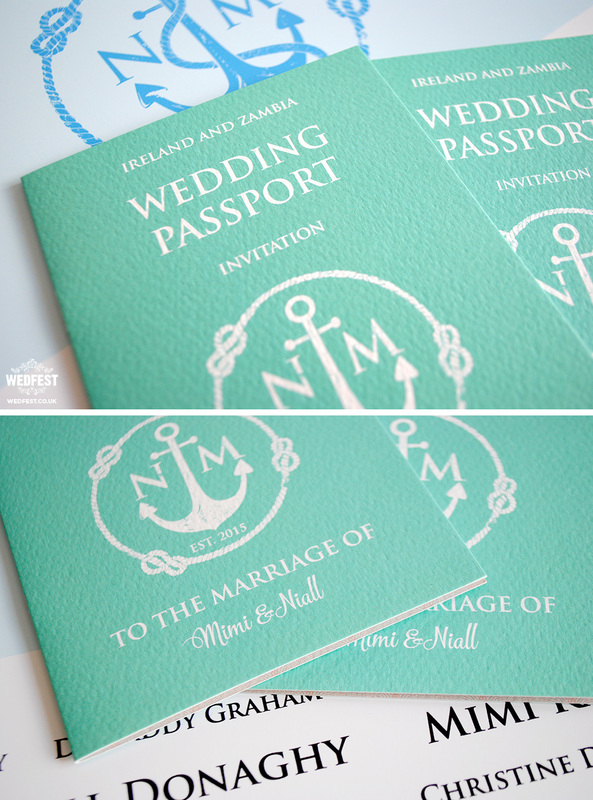 We then designed the couple an anchor style emblem to put in place of where the passport crest would usually appear. On the inside of the passport invites the passport style design theme continues with the details of the wedding and reception laid out in the actual main passport documentation page, with all the little details being used to make up the information on the passport to marriage section. 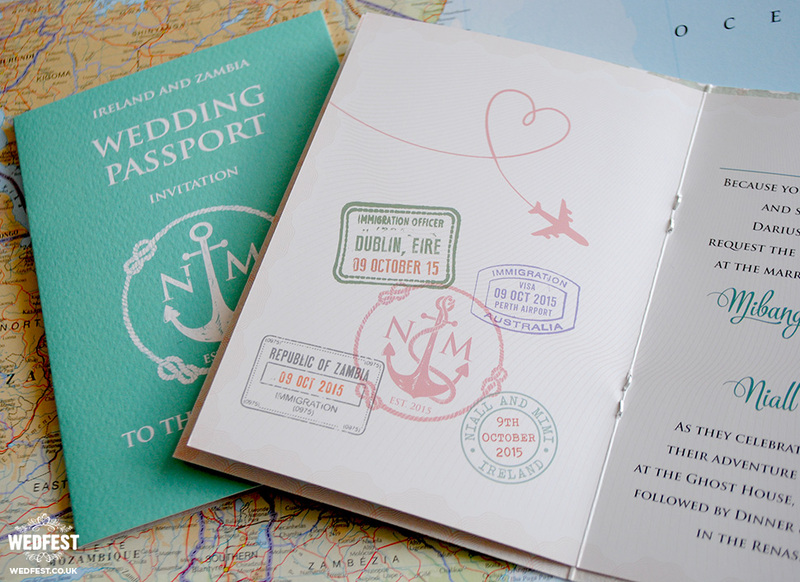 The background of the wedding invite featured a map of the world highlighting the couples journey and home countries, including where they met. This is completed with little passport style stamps from each country featuring the couples wedding date and other details. 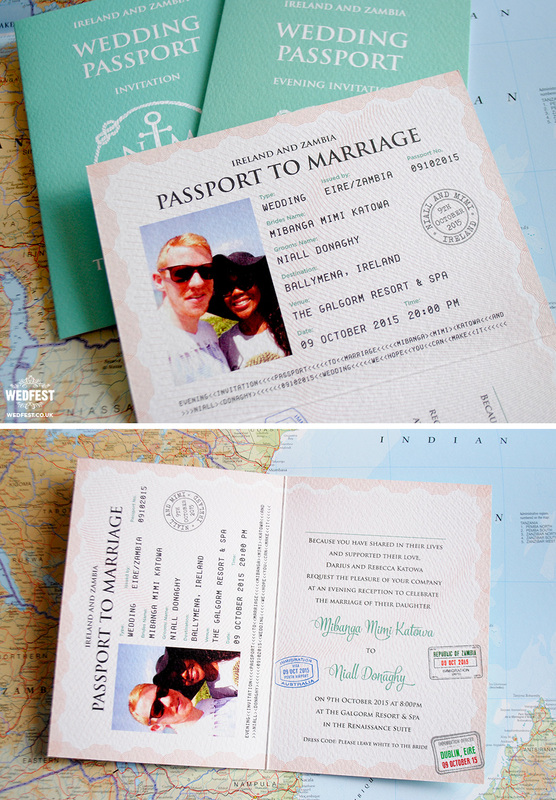 These passport to marriage wedding invitations are perfect for any couple who have met through traveling or were travel is a big part of their lives. They are also perfect for any couples who are going to get married abroad or have a destination wedding and they want to tie their wedding stationery into this travel theme. 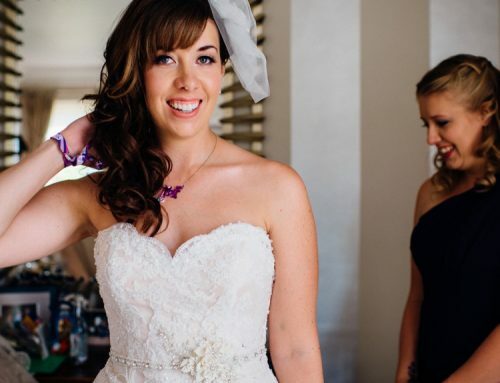 Here at WEDFEST, we’ll spend all the time you need in the creation of your unique invitation. You can choose the colour, images, text style and so much more, as you create your unforgettable alternative, within our innovative passport format, to a basic, run-of-the-mill wedding invitation. Mark Twain once said that to get the full value of joy, you must have someone to divide it with. At a wedding, that division is surely extended to all your guests. A stand-out starting point, like these terrific passport invitations, lets those you want to welcome know that this will be an occasion not just for joy, but surely to enjoy! 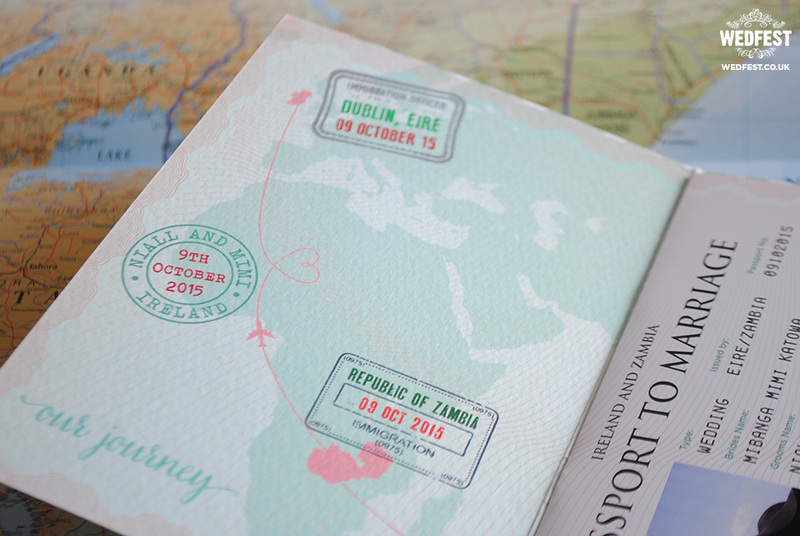 Of course the travel theme doesn’t have to stop at the wedding invites. 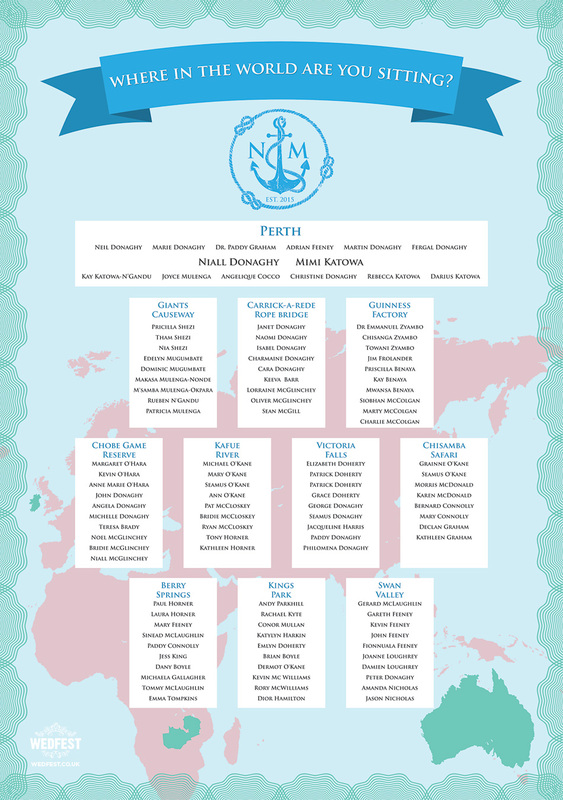 We also made Niall & Mimi a matching travel themed wedding table plan which you can see below. 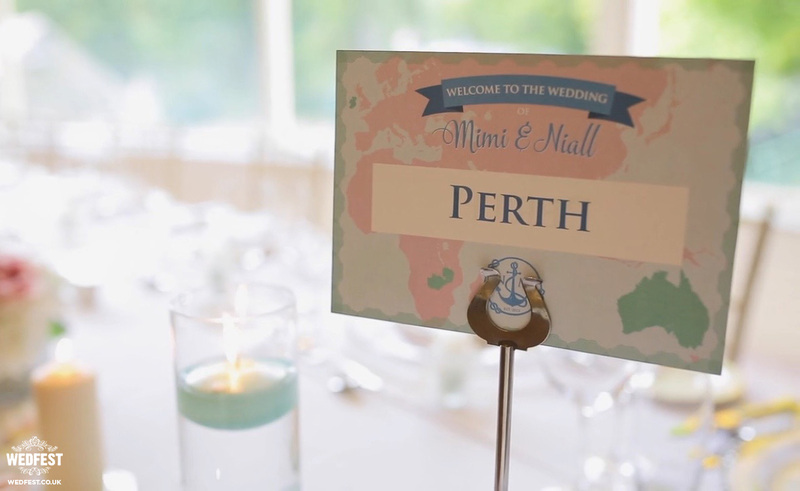 The couple named their wedding tables after places in the world they visited or had special memories from. The top of the wedding table plan read ‘Where in the world are you sitting‘ and then each wedding table featured the name of a place close to the couple. We also created the couple matching wedding table name cards for the wedding table centre pieces. 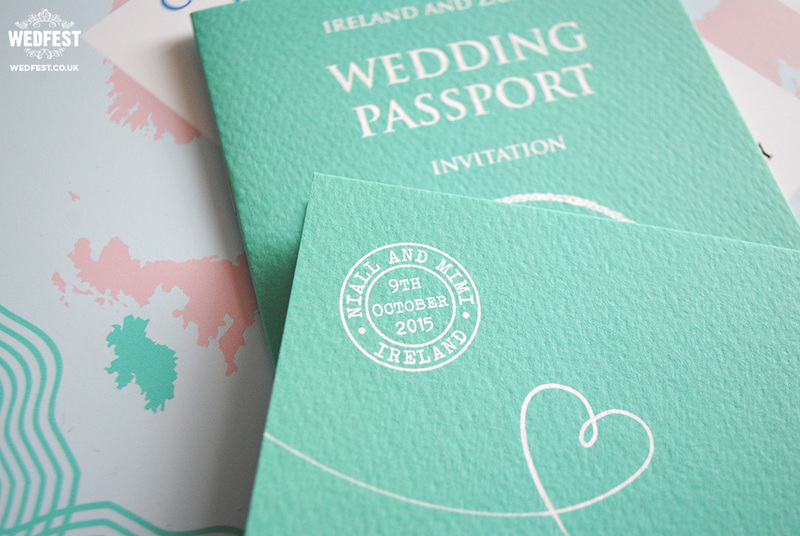 If you like the look of these Passport Wedding Invites and want to find out more about them then please click here to get in touch.